Those solar panels on top of your roof aren't just providing clean power; they are cooling your house, or your workplace, too, according to a team of researchers led by Jan Kleissl, a professor of environmental engineering at the UC San Diego Jacobs School of Engineering. In a study in an upcoming issue of the journal Solar Energy, Kleissl and his team published what they believe are the first peer-reviewed measurements of the cooling benefits provided by solar photovoltaic panels. Using thermal imaging, researchers determined that during the day, a building's ceiling was 5 degrees Fahrenheit cooler under solar panels than under an exposed roof. At night, the panels help hold heat in, reducing heating costs in the winter. "Talk about positive side-effects," said Kleissl. As solar panels sprout on an increasing number of residential and commercial roofs, it becomes more important to consider their impact on buildings' total energy costs, Kleissl said. 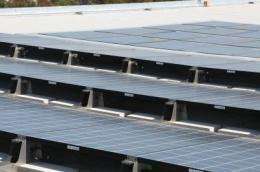 His team determined that the amount saved on cooling the building amounted to getting a 5 percent discount on the solar panels' price, over the panels' lifetime. Or to put it another way, savings in cooling costs amounted to selling 5 percent more solar energy to the grid than the panels are actually producing for the building researchers studied. The panels essentially act as roof shades, said Anthony Dominguez, the graduate student lead on the project. Rather than the sun beating down onto the roof, which causes heat to be pushed through the roof and inside the ceiling of the building, photovoltaic panels take the solar beating. Then much of the heat is removed by wind blowing between the panels and the roof. The benefits are greater if there is an open gap where air can circulate between the building and the solar panel, so tilted panels provide more cooling. Also, the more efficient the solar panels, the bigger the cooling effect, said Kleissl. For the building researchers analyzed, the panels reduced the amount of heat reaching the roof by about 38 percent. Yup, friends who had panels installed said when not using the AC, the upstairs wasn't getting as hot. There was an article recently about how few takers there are for a retrofitted solar panel roof despite the enormous electric bill reduction. It might have to do with the $75.000 upfront cost that the homeowner has to foot, and then gets reimbursed with tax breaks and other government rebates. Obama could make history and possibly guarantee his re-election by subsidizing solar panels and making the initial setup less daunting for homeowners, sparking a new, green type of "keeping up with the Joneses". The physical design of solar panels might be an interesting new area of research. Passive cooling is an added benefit that might be further optimized. regardless of solar panels i've always thought that a floating roof shading the house's structural roof would make a lot of sense. it's always seemed insane, the air conditioner trying to do battle with the attic's "furnace" just inches above the ceiling. Question is: what's the real production and mounting price behind them? Because if it takes 10 000 to make them and their final price is 70 000, then there is a burden there for the user. 70 000 dollars is quite a lot for a roof. Maybe some research has to be done in the economics of solar panels in order to state their real cost. Btw, if the roof gets hot, find other solutions than AC. It's eating energy. Say some reflecting paint or slaked lime cover. I am reminded of the safari-roof principle (as used on Land Rovers), if you can't afford solar panels what about using (thin corrugated) sheet steel panels with an air-gap to do the same thing?